Feed a cold, starve a fever. Or is it the other way around? 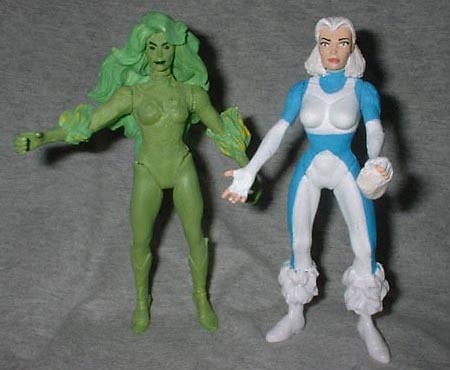 Fire and Ice were two of the mainstays of the Giffen/Maguire-era Justice League. These two women became good friends, despite their opposite powers and natures. The Giffen League was a funny book, with the characters given personalities instead of simply broad strokes. The humor that the book managed to display while still dealing with serious threats is fondly remembered to this day. Fire was made from a Poison Ivy torso and legs, with the Black Cat's arms and head. Ice was the Black Cat's torso and legs with Poison Ivy's arms (tell me you didn't see that coming; boil and pop is our friend) and the head from a Savage Land Storm. I sculpted the extra little bit of hair for Ice, and used the piece of clay I had left over to create a small snowball. Which bad '80s comic creation do you like best? Tell us on our message board, the Loafing Lounge.